The Professional Regulation Commission (PRC) has released on Wednesday night, September 16 the full list of passers for September 2015 Medical Technologist (MedTech) board exam. 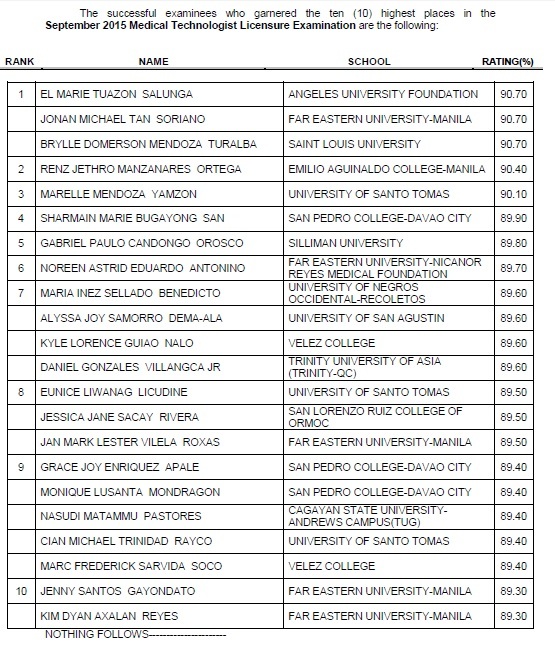 El Marie Tuazon Salunga of Angeles University Foundation (AUF), Jonan Michael tan Soriano of Far Eastern University (FEU) - Manila and Brylle Domerson Mendoza Turalba of Saint Louis University (SLU) got the highest place with identical 90.70 percent grade. Renz Jethro Manzanares Ortega, agraduate of Emilio Aguinaldo College (EAC) - Manila ranked second with 90.40 average grade.